Although it's a Sunday, we consider this the last day of our vacation week. (Somehow it seems wrong to consider Sunday a vacation day but never mind.) We set off on an expected short visit to our own Cleveland Metroparks Zoo. We arrived just before official opening for the day today and hope to plan our visits that way often in future: early arrivals get prime parking spots, no lines at the gate, and the animals are active. The flamingos were more interesting today than at any time we have seen them before, close to their enclosure wall as well. The cheetas were also busy: chasing, pacing, and one even jumped up into a tree — also something we'd not seen before. We were shooting photographs a good part of the time, taking it easy and trying not to overheat in the mid-July sun and humidity. It was in the Primate, Cat & Aquatics building that I got my two "shots of the day." A newly-arrived clouded leopard was exploring its indoor enclosure giving me many opportunities to capture its image. I consider the clouded leopard to be the most beautiful of the great cats. At any rate, I shot many exposures of the animal using my little Canon PowerShot G11 and was rewarded with two pictures that I love: a lovely still portrait and a more dynamic image of the cat. Then we went home to hide from the heat. Tomorrow it's back to the daily grind. It won't take long for the stress to build back up but at least we'll have pictures to remind us of happier times! 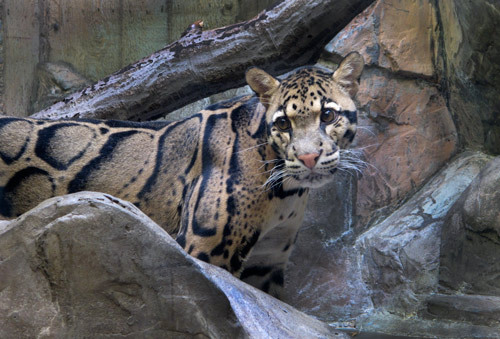 That clouded leopard is beautiful. I have never seen one like that! What a gorgeous cat! I am glad you will have pictures of your vacation to remind you of the fun you had! It is very hard to get back to the daily grind fo things. I am usually a bit down after time away. My, my, what big eyes you have. This cat is certainly taking in everything around him. I've never seen a clouded leopard before, but when the photo appeared on my screen, my eyes immediately went to the design on his body. It reminds me of a snake skin. The markings are so unusual, and it almost seems as though the head belongs with another body. Very beautiful. 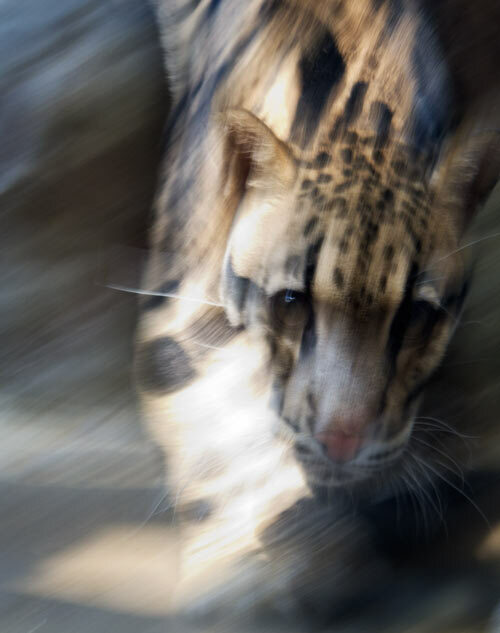 Do you know if this is a "natural" leopard, or are Clouded Leopards "designed" by man? Beautiful. I hope this is a very well maintained zoo to bring in an endangered animal. I'm sure all the animals were anxious the day you were there since it was the "Grand Opening", and the noise and commotion of all those humans would cause even a HUMAN to feel threatened! Love his snake skin fur, though. Hopefully all the animals will settle down and adapt; otherwise, the zoo will have to ship the stressed-out ones to smaller zoos. And you sound as though you really needed that week off from work. I'm sorry that you're back in the grind. I'm lucky in that I can do most of my work at home, but it also leaves for the loneliness of not having any interactions with fellow employees. Sometimes I think that having an office would be nice because then you have the ability to make new friends. I'm sorry you had to go back, though. Is there some way you can get some paid time off…medical issues (stress), sick leave, some type of study you're involved in or upgrading of skills? I wish you the best. So beautiful! We've not been to a zoo in a long while.